Come and enjoy a carefully designed �Day with a horse�. Feel free to bring blankets and snuggle up with your friends and loved ones. 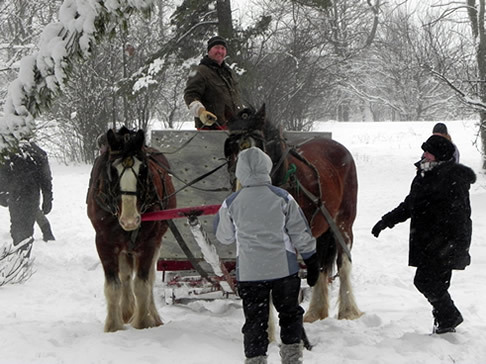 Included in the sleigh ride is the use of the country hall for one hour afterwards where you can warm up by the wood stove with a cup of hot chocolate. Please Note: If someone is celebrating a birthday we have a tradition where you have to kiss the buffalo! If you would like to stay longer please enquire – additional fees apply. (There may be a group booked after you so timings are critical and must be adhered to). Add a bonfire and marshmallows for $40.00. Harbour Pizza - 613-623-4606 - pick-up or delivery for your convenience if you want to order pizza in for your group. visit them on facebook for their menu. They have the best pizza! Absolutely NO PETS permitted on site. Thank you for your understanding! Please use the booking request link to request a booking or more information. Thanks and we look forward to having you as our guests!